I’m chuckling to myself even as I begin to pen this. This is sacking season at Ferrari and TJ13 readers and I were batting ideas around on who may be in the frame for this particular round back in November. Luca Colajanni head of communications for Ferrari F1 has been ‘offered’ and accepted a move to the car division and a ‘Europe/Middle East’ role, he will be replaced by Renato Bisignani. It is delightfully ironic that Ferrari have just bumped this out there, nothing on the website and no explanation. Communication indeed. Anyway, who is Bisignani? He studied at the esteemed “Scuola di Direzione Aziendale” (School of Business Administration) which is the graduate business school of the Bocconi University in Milan. He was Deputy Commercial manager for the Renault F1 team before moving to Ferrari where his rather broad title of “Business Development Manager” tells us not a lot. F1passion, an Italian blog site called this appointment over 3 weeks ago, on the 23rd December. They also report that Renato was originally recruited from Renault at the behest of Il Padrino, Luca de Montezemolo. This is hardly surprising with Luca’s known political connections to Berlusconi, who in turn is said to have appointed ministers to the Italian government on the say of Renato’s father Luigi. Renato ought to make sure that public access to his Facebook page is sorted soon, as he has home page postings include…. 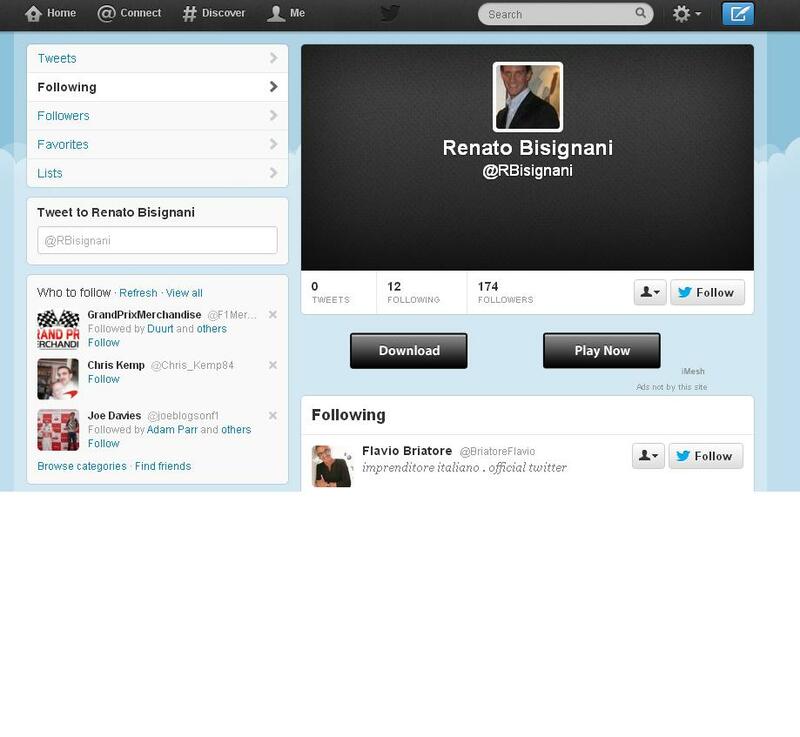 Young Bisignani also has a twitter account with 174 followers and he follows the following select list of people. 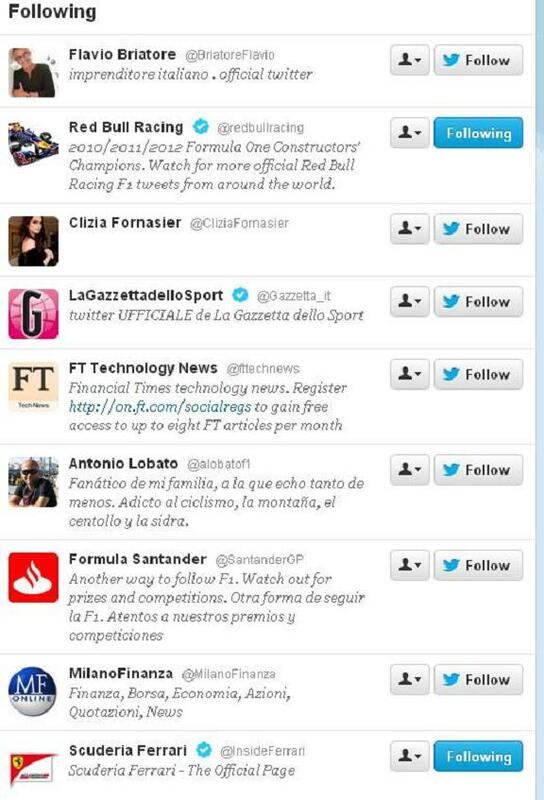 He is following Felipe, Fernando and WSJ business news too but I couldn’t fit them on the screenshot. However, Renato has a rather infamous father, Luigi who the Corriere del Serra suggest is ‘one of the most powerful man in Italy’ (LINK). Luigi was the Italian treasury ministry’s press officer during the 1976 and 1979 governments of Giulio Andreotti. When not working for the treasury ministry’s press office, Bisignani acted a current affairs reporter for the Italian ANSA news agency. He was implicated in the 1990’s as part of a secret group of peopled called ‘P2′ by the Italian prosecutors. This was a society of the highest influence and extended into the upper echelons of the Vatican. It is believed that billions were laundered through the Jonus Foundation set up to help poor children, and the subsequent investigation was known as the “Enimont’ operation. The accounts showing each of the deposits and withdrawals from the fund were ‘lost’ by the Vatican, and three of the accused in the Enimont saga died in tragic circumstances. “Tthe President of ENI Gabriele Cagliari with a plastic bag on his head in a cell of St. Victor, the director of the operation Enimont, Raul Gardini, was shot with a 7.65 caliber round at his home in Milan, the Director-General of the State Holdings, Sergio Castellari, had his face crushed in the Roman countryside.” as reported by Il Fatto. They suggest, Luigi walked away with a couple of billion in face bearing bonds marked, “pay the bearer the sum of….”. Luigi Bisignani was eventually sentenced in 1998 to two years and six months in prison on knock down charges relating to illegal transfers of funds and he was expelled from Italy’s journalists’ association. In more recent times Renato’s father has served as the Executive vice president for the international business Ilte Pagine Gialle group (yellow pages) and was an advisor to the Italian rich and powerful who sought his opinion and connections. Luigi he was to experience a not so pleasant Deja Vu when in June 2011 the Italian prosecutors came knocking again. Bisignani was placed house arrest in connection with accusations of aiding and abetting and actual passing on of state secrets to third parties. These charges were in conjunction with what became known in Italy as the ‘P4’ Investigations into a corruption ring with many illustrious Italian names filling national papers. The list seems to be without end and includes businessmen, high ranking politicians, policemen, secret service agents, a general, and the ex-director general of Italy’s RAI state television. Luigi agreed to a ‘plea bargain’ with the Italian prosecutors in November 2012 according to Corriere del Serra. He will give evidence against his co-accused and in return will serve 1 year and 7 months in jail. Eat your heart out Dan Brown. Anyway, we should be gentle with Renato – his family reputation clearly could weigh heavy on his young shoulders. Yet I suspect he is a very savvy young man and has learned from his father’s experience – one way or another. amended as advised. I do appreciate the grammatical and other corrections provided by you all. Don’t think we’ve spoken before. Welcome. To be honest, the content here is pretty good and original. One can over look small grammatical errors in a free blog that keeps us informed. The article is very, very interesting. It reminds me of a discussion I had with a colleague a few years ago when i worked with a small mining operation. At the time, we were trying to further penetrate the Chinese market and occasionally dealt with some Euro areas. Anyhow, when dealing with Italy, he said “it is harder dealing with the corrupt Italians (a well established market) than what we are facing with the Chinese! (Which at the time was relatively new and communist territory)”. I was thinking the same thing yesterday. So much for not having much to write about in the interim period, Judge! Its always been there – just no one bothers finding or reporting it. The hard pressed pass holders need some R&R in Dec/Jan/Feb before they begin another grueling jaunt around the world – whilst dailing making sure they don’t upset Ecclestone et. al. I could tell you about Newey’s revolutional ‘cantilver design’ bar thing… but I don’t understand it – could do with a tech writer in partnership I guess..
TJ13, I would very much enjoy an article about his ‘Cantilever design’. “ppsi” just went woosh over my head, TJ, but the first hit I googled up was this: “Project Preventie Seksuele Intimidatie”. . and so I propose PPSI – whatever it means as you meant it – most certainly has another use in the every febrile gardens of F1. How are we doing on the chance of a “permathread” on blogging geekery, TJ? (as mooted when Rpaco was tizzied over the RSS feeds and the goog – hmm, I get into old git territory often enough, so not teasing rpa on that) Bung me a Q offline, if you like, but I’ve been chomping at the bit with some accumulated thoughts as to not back breaking things blogs don’t seem to have as reader – useful features. Think would be a good thread, as you plan this all as a experiment, because I think that would entice a fair few to pay attention .. I see a fair few F1 fans in the good hacker community out there. Just so rarely any real nous about F1. Do them a favour! If its possible we’ll do it. Mail me on thejudge13@hotmail.com. Open too all tech ideas. F1 bloggery as well as reporting not 21st c.
Yup, stuck in 1987, TBH. That’s the underlying level of sophistication of blogs, as far as I can see. Design stuck in the mid – late 90s. (yeah, I know some blogs go to town on graphic design, but take away the chrome and gizmos, and you don’t get much left. If I got started on what passes as a “modern” / “trendy” blog design, I’ll puke at the homogeneity and boredom of it all) I mean some BBSs had more features, and I still nearly swoon when I think that a “revolution” was based on hypertext links, only to have everyone hoard them to themselves, breaking the web neatly so Mssrs Les Goog can play arbiter. The real problem is that the majority of who are experienced enough to know their business in F1, grew up in a stifling print atmosphere, and despite what we all may think about the opening of journalism by the web, what happened instead is I believe that established apprentice paths were wiped out by a combination of too many new entrants and the tardiness of the print world to adapt, adopt, embrace or just plain make use of all we have, causing financial pain, reticence, resentment, inaction . . I think we may have lost a generation of journalists as a result. Nice, if you are established. Probably a God Send if you are established, with this economy, because the drought will mean at least you can earn into your pensionable age. But downright awful, if you are starting out. I am also trying out Bamboo RSS reader but still prefer Newsfox. Early 1993 was pretty ‘on’ for an off season also. Lots said and reported. Lots of politica. Senna was with Mclaren on a very unhappy race by race basis and didn’t even show for the first test while Andretti was joining. Prost back at Williams after sabbatical and had the well publicised senna veto! A young German pretender was on his way up with a flamboyant Briatore extolling his virtues. Was an off season full of intrigue. This one is great too as the advent of the Internet makes things more immediate. what makes you think Colajanni has been fired? I know Joe S suggests this is a big move for Colajanni as it includes India a growth market – but it’s not how the Italians view this – car division or Scuderia? Not even a close call. I do point out Ferrari were rubbish in the way they released this… but the Italian blog F1passion appears to have known this is coming for a while. We haven’t even had the ‘thanks for the memories’ stuff from Luca – or the ‘its a great new opportunity’ from Colajanni which itself is suspicious. I also admit in the article we don’t really know and speculate that the Ferrari communications debacle from Japan onwards may have been a contributory matter. The observations I made on Ferrari.com ‘phony in house war’ (Oct/Nov) and the general handling of their ‘problems’ in public – are a matter of record on this site on more than 1 occasion – so I don’t believe it is too big a leap to then link the 2. Anyway good to hear from you Jack. Don’t be a stranger…. I have to say that I resent this article very much, mr. 13th judge. I don’t know and don’t really care to know whether you aspire to be a journalist (hence relinquish your right to include opinion in your writing) or simply to remain a blogger (and keep said right). Regardless, your generally anti-Ferrari bias in the first half of the article is painfully clear for any dimwit to see, as is your general anti-Italian bias in the second half. Both are very annoying and extremely unoriginal, because in case you haven’t noticed you’re simply jumping on to the recent journalistic bandwagon along with all the other people void of original thought, and spewing the same old stale anti-Italian and anti-Ferrari (which is very representative of the country) “corruption” rhetoric, as if they were the only F1 team and country to operate unethically. I also find extremely annoying that you’re obviously implying how Renato’s lacklustre family history of corruption and extorsion makes him a perfect fit for the “unethical” (and who are you to be throwing that word around) manner in which Ferrari is accustomed to operate. I don’t know what country you’re writing from, but I can almost guarantee you that F1 teams and government officials from that particular country are just as corrupt and disgusting as how you paint their Italian counterparts to be, if not worse. The only difference is that yours are more secretive about it, and that makes them far, far worse. I love Italy, would live there if I could – visit Italian friends there a couple of times a year and I think Ferrari are the best thing for F1 EVER. Respectfully I have not suggested Ferrari is corrupt, and my article about Luigi is old hat to any Italian who has ever read a newspaper. I was buried with news print from the Italian press who have covered Luigi’s altercation with the Italian magistrates and his fraudulent, corrupt and apparently traitorous behaviour in more words than I can write in 100 years. But I have no time for F1 pretension and sacred cows. Englishman Johnny Herbert I suggested in the last 2 days should be sent to the North Pole. Sir Jackie Stewart, Lord of the realm, has persistently come under thejudge13 microscope, and even the great Ron Dennis who I think has done an incredible job with McLaren group – has been critiqued for letting Hamilton go. It is difficult for you reading just 1 or 2 articles to understand the irreverence but fair criticism TJ13 tries to apply to F1. Anyway we appreciate your contribution and in the words of the mercurial Ferrari Spanish driver. forza di ferrari!!! Having read these articles for some time now, I can safely say they are very fair. An equal view is taken over all team, countries, etc. You have to admit that many goings on in Italy have been dodgy to say the least….’Il Giorno Della Civetta’ springs to mind. However, I do appreciate your point about it happening all over the world in all governments. Just look at the “deal” Bernie Ecclestone did with the Labour party (British Government) in 1997, over F1 getting a special ruling for tobacco advertising! Only for this to change after the public outcry that followed. Well said. And our own Max Moseley has regularly felt the weight of the reputation of his father Oswald (fascist leader in the UK). I could go on…. I believe, from snippets of memory, my father may have had a run in with Moseley Snr., dad being CPGB until that was untenable for him. (He had a number of radio plays banned during the second war, seconded to the Home Guard, and amusingly, he was a seaside town bank manager – Don’t Panic!) and I can only imagine, but with half a clue, what a legacy having Oswald as a father might be. Maybe just because I recognise that legacy and what it might mean, I’m a bit of a MM fan. I think it certainly took Max a deal of spirit to carve for himself any niche, and F1 was his escape, as well as his trap, because it was a strong attractor to the very machinations that were his legacy. My father spoke German, too, but only when peed off. Thanks to Adamac39, I’m picking up a translation of The Day Of The Owl (I’d never get my bistro Italian through a novel) and it looks worth looking forward to the reading. My apologies for the embedded jpeg, that was automated, and I didn’t spot it. One for the tech thread, let’s get previews for posts. Thinking back to that dramatisation, and I take a liberal stance on advertising what is legal to sell, though I do not deal with either tobacco or alcohol advertising myself from choice, I cannot guess at whether adland or the tobacco companies would be more likely to put BCE up to that stunt. You see, by unveiling a blatant bribe, they tied the gubernatorial hands. The minute one can be seen to be swayed, one must not be swayed one way or the other. Therefore, status quo. Putting my tin foil hat on: have a look what proportion of your pension or 401K is constituted with Big Tobacco shares. IMPT was a awesome buy in 99 or so. These companies have super strong cashflow, the very kind required to finance a pension duration. They are very tempting stocks to hold, as a result. So, you could try to stretch it, and argue that they are such a proportion of long term savings plans, that to remove them from a portfolio would have much greater effects in the wider economy, at the same time most pension funds are underfed. That would more likely be the lobbyists’ stance. But pulling a stunt with BCE taking the booby prize, on No. 10’s doorstep, nonetheless, might have been a super short cut. is it actually incompatible for someone to hold a journalistic integrity, even if they are not professional as in employed as such? And is it not the prerogative of anyone who writes to hold a opinion? Many of the best authors hold strong opinions, and when they are strong enough to be clear, a reader should not feel cheated, because the bias, if any, is announced, and the reader is at liberty to discount that and interpret as they please. I believe firmly that professionalism is in the act of a craft, and that further, professionals in technical disciplines tend to hold no secrets. I could explain to you my work, I do that every day to who may be interested in following my line of business, but there is no “secret”. Equally, there is no secretiveness in good writing. If a writer can state their point, the job is done. I daily read papers, journals and magazines whose biases I know well. The Economist has a distinct voice, for example, but sells nearly a million copies a week. Their bias is blatant, almost comic book, but it’s good to read because they articulate well. Moreover, I think if you say someone is implying a message beyond their words, it would be fair to explain better how you arrived at such a conclusion. I could site, say JS, out of context, and say, “well, Joe, you said x, y and z, about so-and-so and does that not mean you think this of them?” but that’s not the case with JS, nor I think with TJ, here. When you distil journalism of any kind, career professional or dedicated amateur, I think you always end up with indissoluble nuggets of opinion, but they are insignificant in the oeuvre of any larger body of work which attempts to report. Dear me, it should not require accreditation or the penumbra of some kind of ethical regulation, to exist before you or I participate in this thing called a blogosphere, which exists entirely to allow the unencumbered variety of thought to winnow to the best. I fear you walked into a all you can eat bistro, and are complaining about the variety. No offence intended – just in UK, no one will be aware of his dad – who in fact is very well known in Italy. I hear Renato is well thought of at Ferrari and to be fair, their communication and co-ordication of media releases needs sorting out. I wish him and you well sir.